Lately I’ve been a very intermittent online gamer. I come for the parties. My plan next year is to actually play some games. Until then, here’s my year in retrospective. 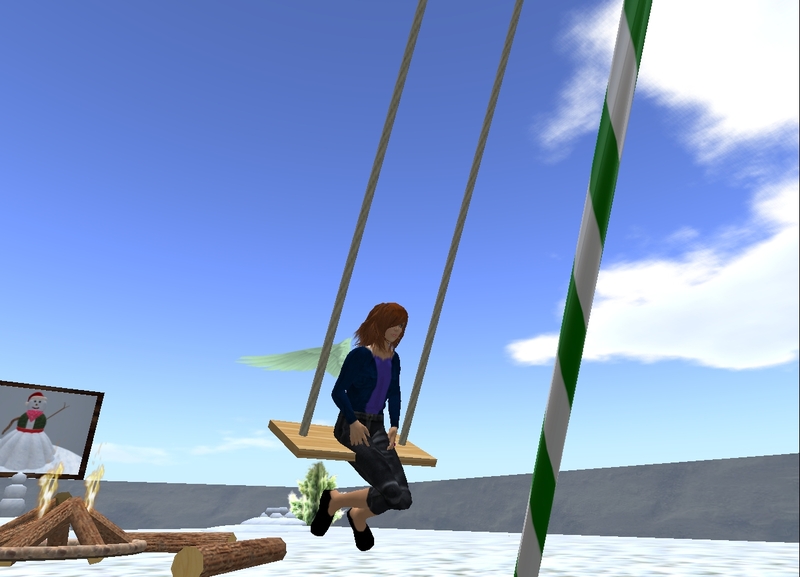 Swing party in the snow, Second Life, December 2009. 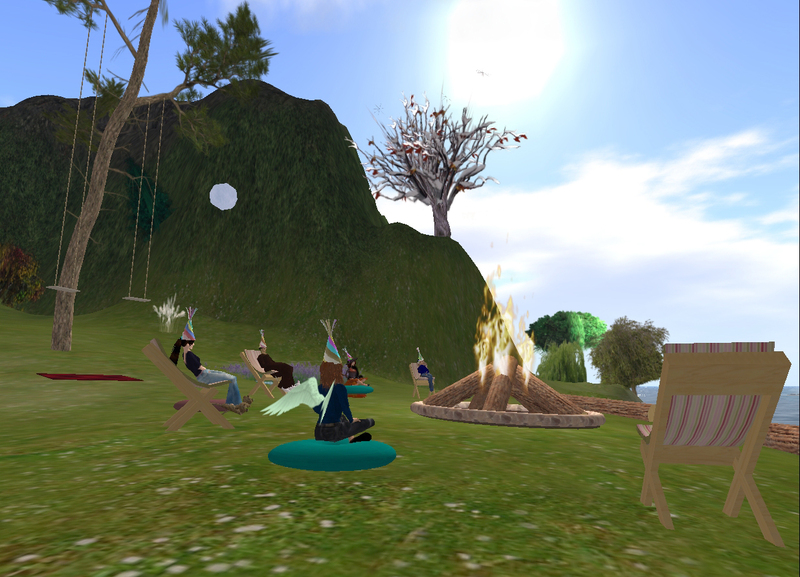 Second Life is a virtual world where you build things or go experience what other people build. This was a party given by people in the Guild of Healers, a small group of people who played Uru and have a location in Second Life where they make things. It’s a great group of people. I always have a great time at their parties. This was a swing party, as in…we swung on swings! I liked the area so much I came back later and played around and took some pictures of my character, my avatar. The people who own this piece of land in SL (yes, it’s thought of as property, as land) created this space specifically for the party. People ask me sometimes if the parties are like parties in real life. If you know the people from your virtual life, and if the people are sociable, it feels like a gathering. Good virtual environments give you something to do, something that makes it seem like your persona is there. There’s music. There are activities such as dancing — click on something or type in a command and there you are, dancing on the screen. 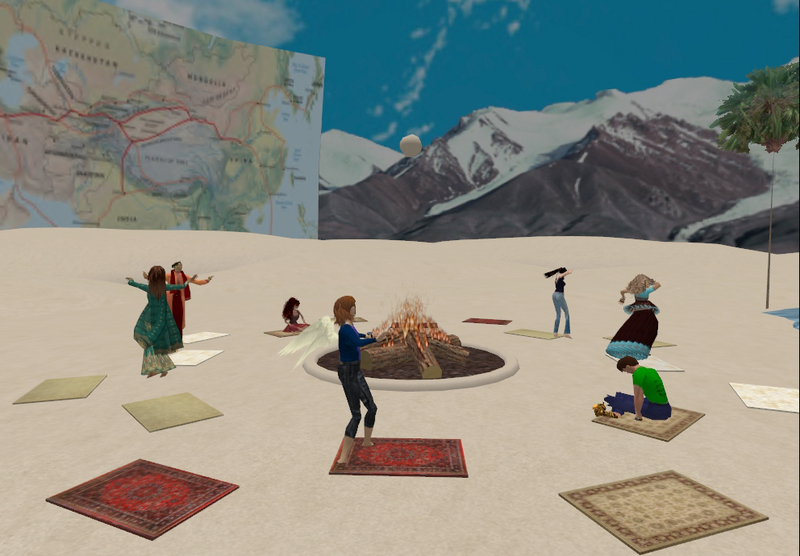 Some online worlds and groups support the use of microphones, where your voice is heard. This group tends to use text chat, mostly. You can text chat either to the group, or privately to a person. I met these people when I was playing Uru. 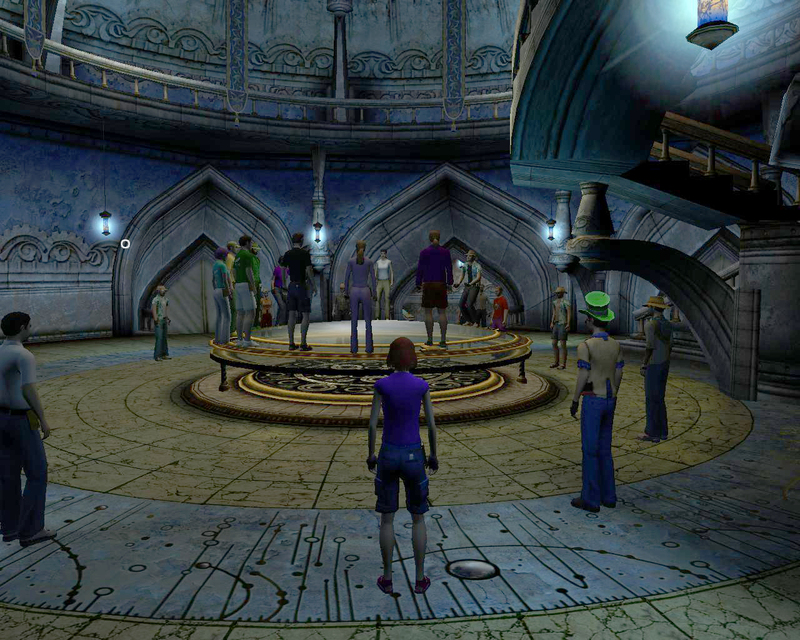 The concept of a guild, a group of people with a shared goal, is common to online games. This guild came from the idea of expanding the traditional guild structure in Uru. I’m the figure with the cropped pants, flat shoes, and wings, because why would you not have wings? 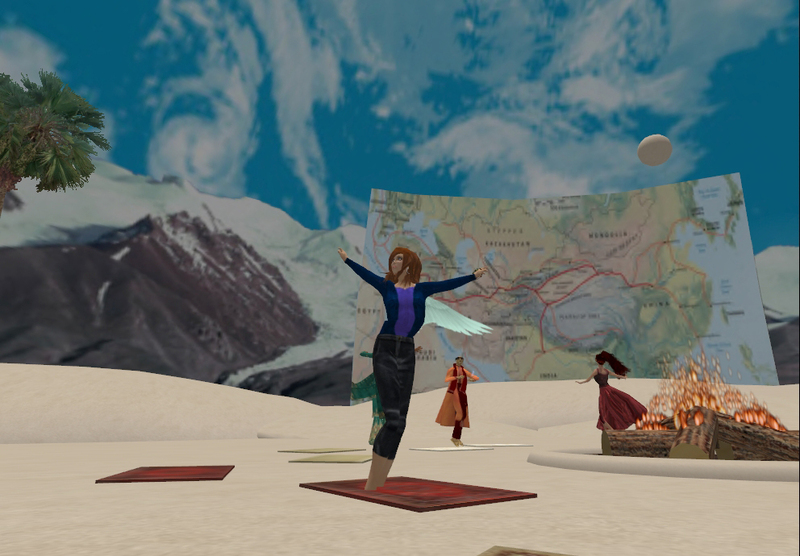 Even without wings, in Second Life you can fly. People change their looks in Second Life a lot. It’s a costumey place. I tend to keep my look the same, now that I found something that suits me. I got some free clothes (people give things away) and paid a small amount of money to get my hair style and my wings. I’m not much for meditation, but the group is so nice that I wanted to check this out. I could use some peace in my life. In this event, the person leading the meditation used a mike to conduct the meditation. We sat on cushions in the lovely space, and the sky changed from night to day. I enjoyed being with the people, but I got distracted. I’m still not much of a meditation person. As I stated before, this space was created by the people who own this “land” in Second Life. 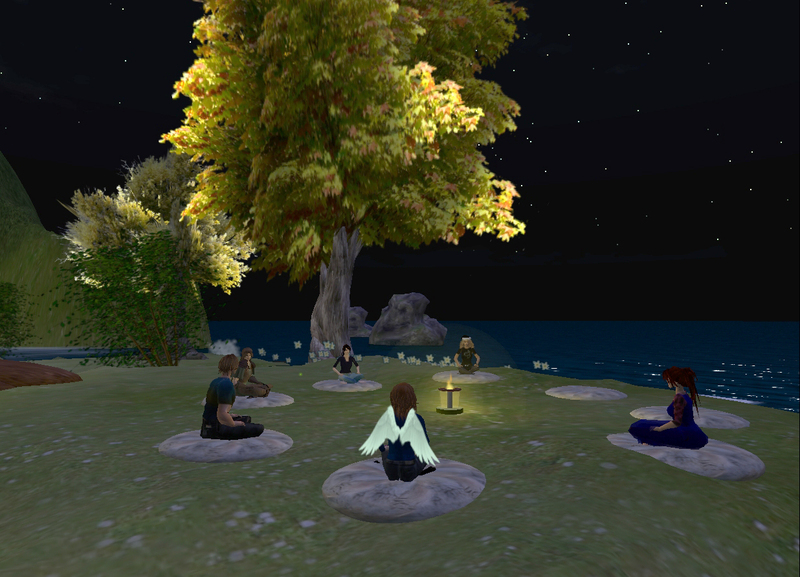 Meditation during the Second Life night, Guild of Healers retreat. 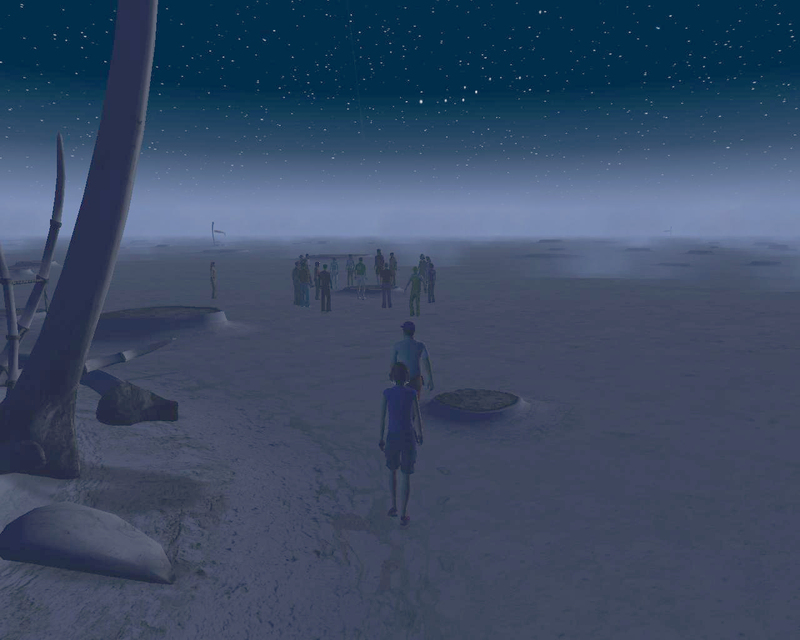 Second Life, December 2009. Dawn, Guild of Healers retreat. 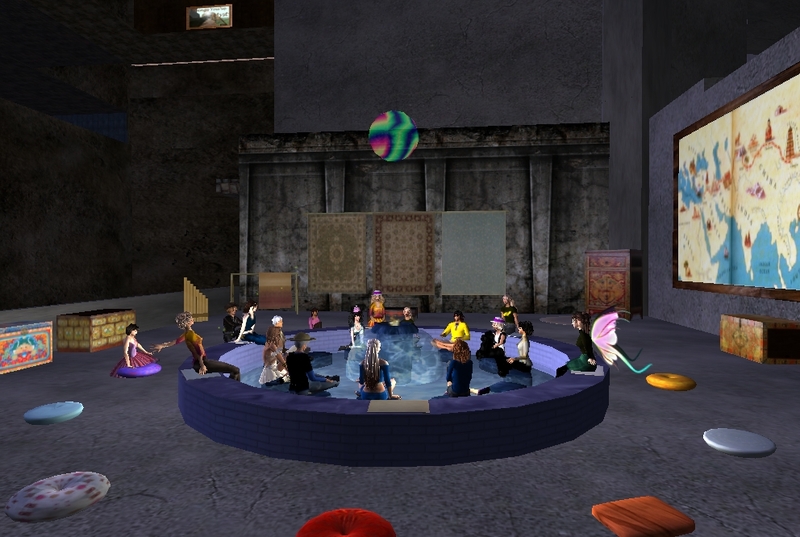 Second Life, December 2009. The meditation continues. Guild of Healers retreat, Second Life, December 2009. Lord Chaos, also known as Ktahdn (game names) took early retirement from his job. Sometimes organizations will offer economic incentives for people to retire earlier than they had planned. It can be a very good deal for the person. 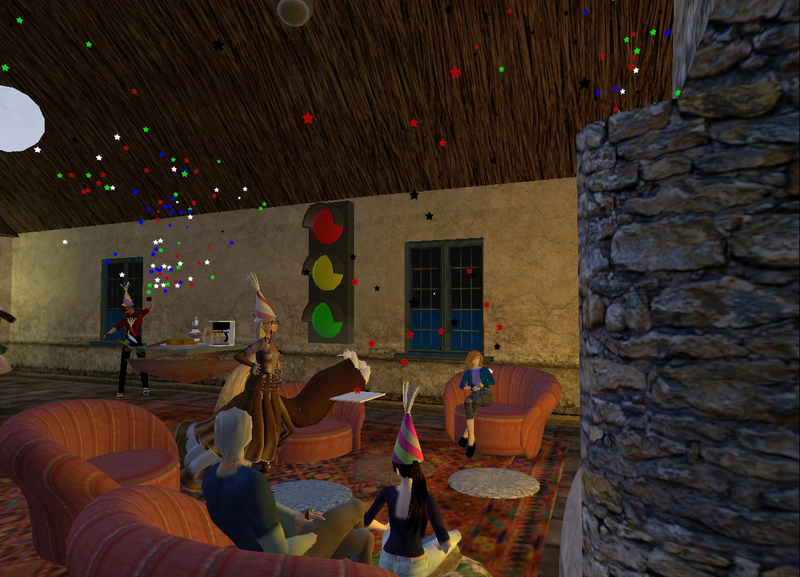 The Guild of Healers had a retirement party in Second Life. We started in an indoor building in a festive space, then ended up outside. 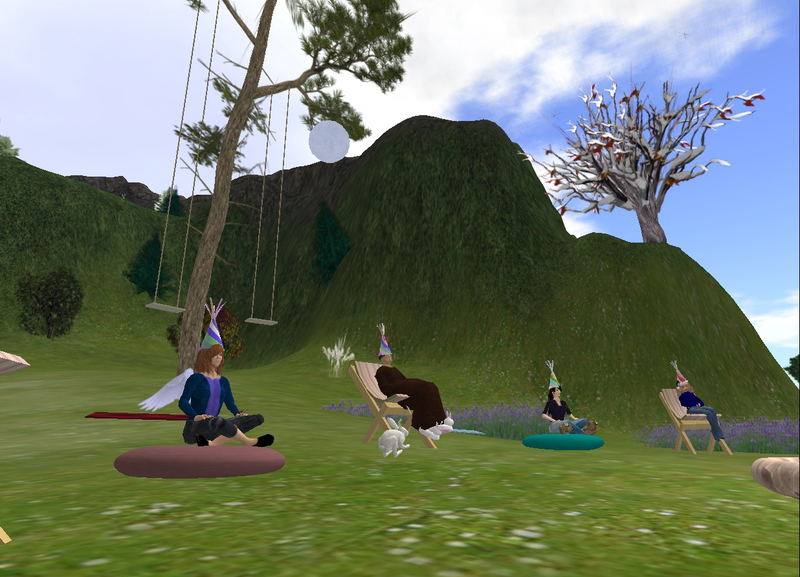 As the party progressed and we greeted the Second Life day, we got quieter, more reflective. Changes in your life will do that to you. Retirement party. We talk and are festive. Guild of Healers retreat, Second Life, December 2009. Retirement party. We move outside. Guild of Healers retreat, Second Life, December 2009. Uru is an online multiplayer game. You cannot create your own content in Uru. This means that you cannot do any customization for an event. It is, however, a beautiful space, so people have events and parties in Uru, because they want to. I’m rarely in Uru, nowadays, but I made sure to attend the fifth anniversary radio show given by Lord Chaos. Lord Chaos is his game name. Online radio shows are a feature of the internet world. People create their own radio shows, their own playlists and private music streams for friends. Some people provide their own commentary, like a true DJ. Lord Chaos does that, a mixture of music and commentary. Since you can’t change the music in Uru, you turn the music in the game off, and then stream the radio show from an internet site. Lord Chaos has great musical sensibilities, eclectic and melodic. Some shows are dance oriented, some are more reflective, and some are a mixture of both. It’s always a great musical experience. Fifth anniversary radio show, Lord Chaos. Minkata, Uru. June 2010. Fifth anniversary radio show. Lord Chaos. At the bottom you can see we are talking, text chat. Minkata, Uru. June 2010. The Silk Road is a collection of trade routes that were used to connect China and the Mediterranean. (http://www.ess.uci.edu/~oliver/silk.html, http://en.wikipedia.org/wiki/Silk_Road, there are many, many other references). In a previous post, I talked about a radio show described as musical journey along the Silk Road. 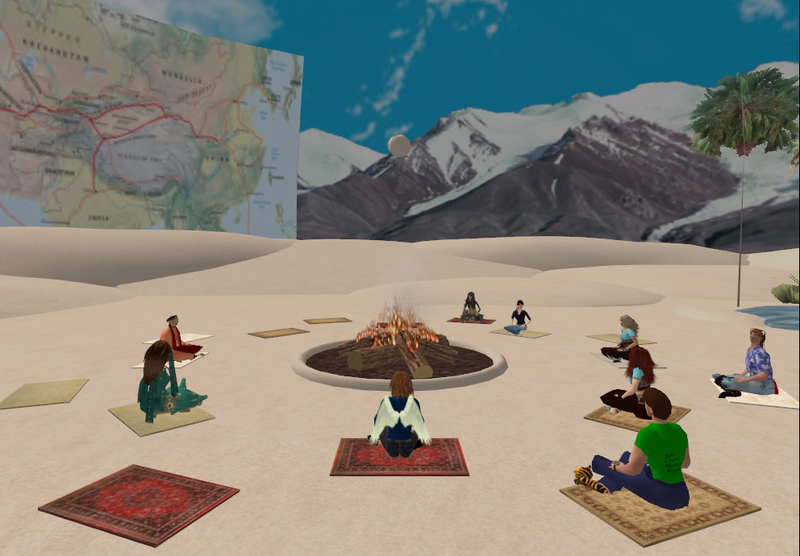 https://amarez.com/2009/06/14/second-life-the-silk-road-a-virtual-journey/. Lord Chaos has done a series of radio shows about the Silk Road. The radio show is structured as a journey, a trip. During breaks in the music, Lord Chaos talks about where we are on the journey, the time of day, the weather and how we are feeling. It’s an interesting experience, very evocative. It has the feeling of an actual journey. This was a very long radio show, eight hours, but not everyone stayed for the whole show, and we had breaks in the music for talking and (virtual) dancing. 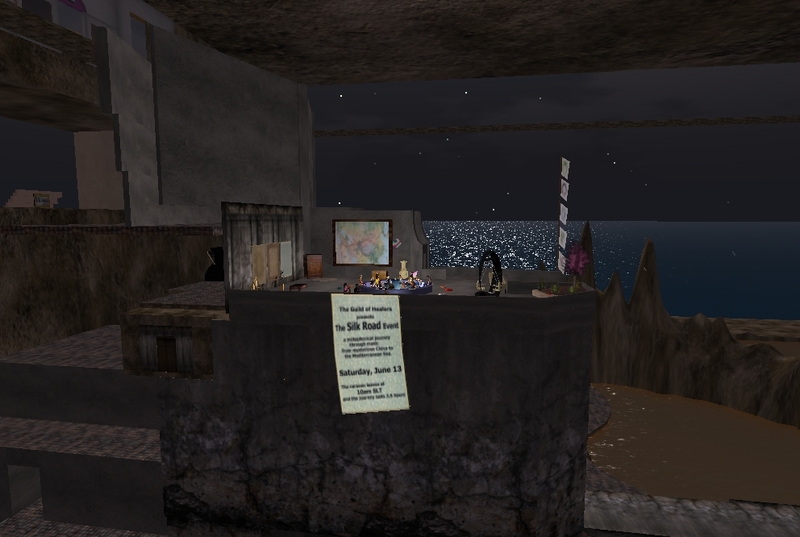 Second Life is a good venue for this – a virtual stage for the musical journey. I had a fantastic time. The Silk Road, a musical journey. We gather around the campfire. Notice the map in the background. Second Life, Guild of Healers, July 2010. The Silk Road, a musical journey. The setting for the journey. 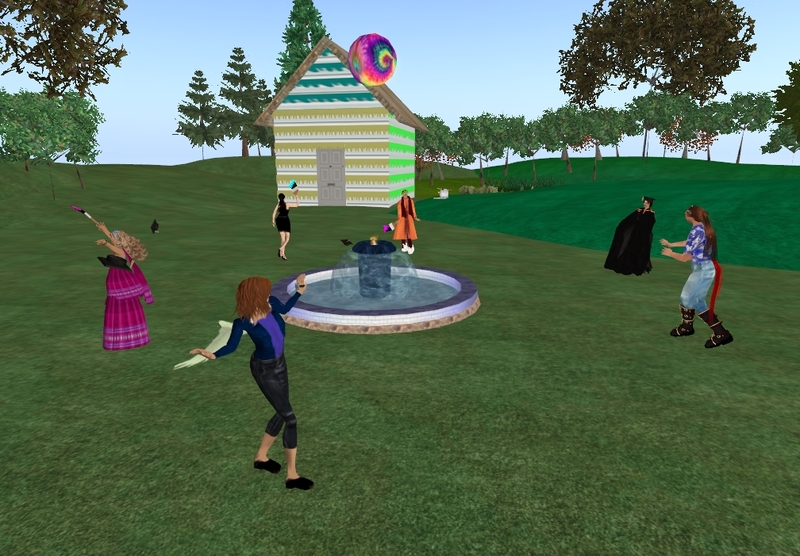 Second Life, July 2010. The Silk Road, a musical journey. We start to dance. Second Life, July 2010. The Silk Road, a musical journey. Amarez, my avatar, is dancing. Second Life, July 2010. 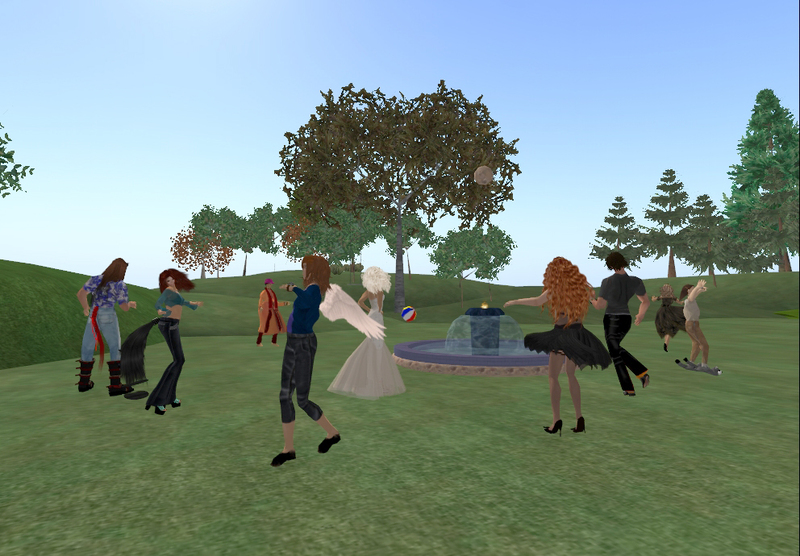 I went to a dance party in Second Life, at the Guild of Healers retreat. Lord Chaos/Ktahdn (game name) was the DJ. We danced from Second Life night to dawn! To be fair, the day night cycle is speedy, not a twenty four hour cycle, so that’s easy to do. Ktahdn dance party, Guild of Healers. I’m in the front, the one with the wings. Second Life, July 2010. Ghaelen (game name) completed her dissertation for her PhD. So, the Guild of Healers had a party. It was wonderfully festive. Ghaelen’s graduation party. As we dance, we float! 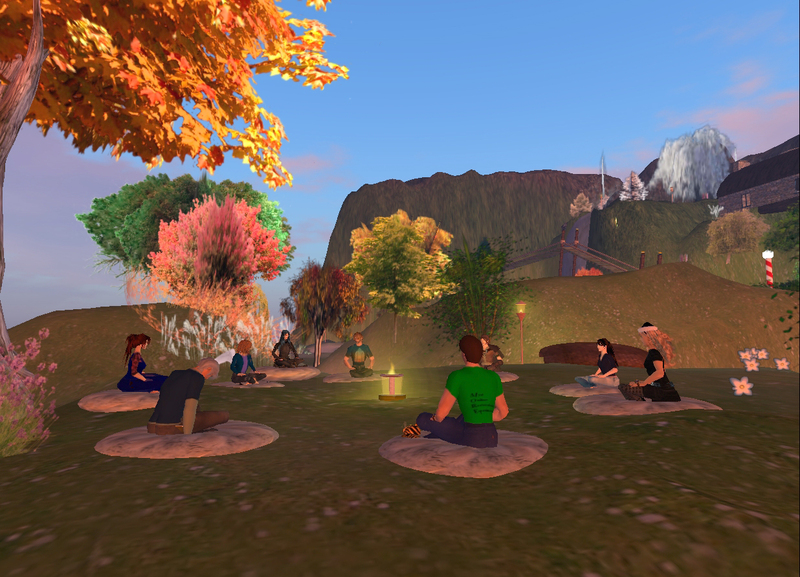 Second Life, November 2010. There will be another party before the end of the year, but I’ll save that for next time. In an online world people have concerts or parties in a virtual space. Your character, your avatar, sits or stands in the space, walks around, dances. People text chat, which is much less intrusive than talking during a concert! 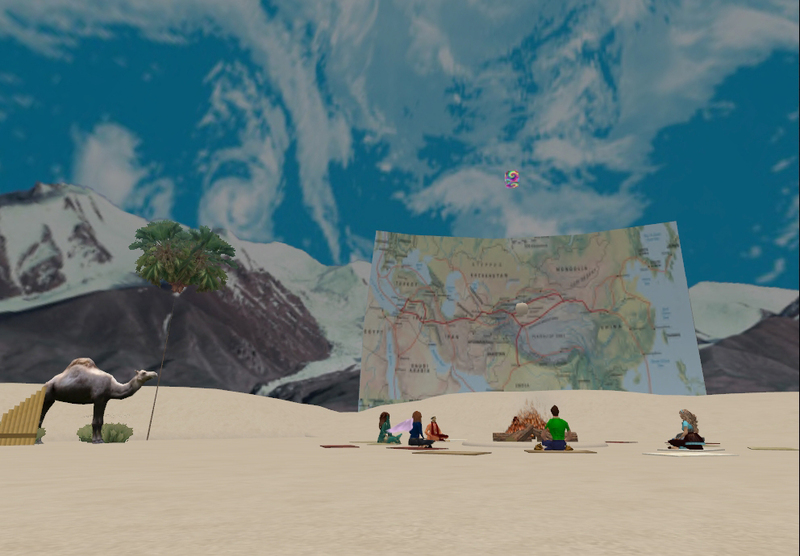 The (travelling) Guild of Healers invites you on a metaphorical caravan………..
through desert and mountain, climbing and descending, to the Mediterranean Sea following the interwoven complexities of the Silk Road. We’ve chosen to meet in Second Life in new facilities provided by the kind folks there, but the music can be heard anywhere people want to meet. We met in Second Life, an online world where the members design and create the places in the world. We met in an Uru themed location. Uru is a multiplayer game that was cancelled but still has a fan following. We sat around a fountain. There was a map of our route on the wall. What followed could best be described as a virtual journey in a virtual space. The creator of the event played music and talked to us as if we were on a journey – “the day is getting warmer”, “the camels are tired”. The music had an evocative theme – think of a combination of a Hearts of Space radio show (http://www.hos.com) and the music of Loreena McKennitt. The event creator text chatted, moving us along the route. The participants also text chatted. Sometimes the participants text chatted as if they were on the journey. Sometimes they texted as if they were sitting around the fountain. Sometimes they texted as if they were in front of their computer. People welcomed other people, asked about something, made a comment on the journey, said they had to leave to do something in the real world, made a joke, talked about technical problems in Second Life (“sorry, I crashed”). This is my favorite way to act in a virtual space, a way that seems most natural. You act as if you are in a virtual space, but you also act as if you aren’t. This type of event is very difficult to do well. Aside from it being a pretend journey in a pretend space, the event was designed to be serious, which is hard to do well. It could have been a pretentious disaster. It could have been boring. It wasn’t either – it was spectacular! In some way it felt like you were both sitting around a fountain and on a magical journey in a caravan on the Silk Route.